It is essential for your body but dangerous for your home. Dampness on internal walls of the basement can weaken the structure of your home. It has the potential to deteriorate the foundation. If your home is susceptible to water damage, it is important to call the experts. Installing a sump pump will reduce the hydrostatic pressure around the foundation of your home and reduce moisture as well as water infiltration. Sump pumps are recommended to optimize drainage system and to keep the weeping tiles clear. Weeping tiles drain the water that pools at the foundation of your home. It is an affordable substitute to traditional foundation excavation and external waterproofing. It is one of the least expensive methods for repairing leakages in a basement. It is ideal for a poured concrete structure. The task of injecting the cracks with polyurethane is easy and quick because no digging is required. We also do epoxy injection in the cracks. If the cracks in the basement are the reason for wet floors, Pour Concrete will use high quality sealants and waterproof coatings to seal the cracks. This technique works best when the hydrostatic pressure is not very strong. 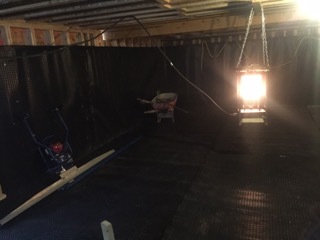 When it comes to quality inside basement waterproofing solutions, Pour Concrete is the contractor that every homeowner of Greater Toronto Area trusts. Not only do we provide affordable services, but we also ensure that our waterproofing solution lasts as long as your home does. Call us now on 647-368-6206 or submit an online inquiry and save your home from terrible water damage.